Now here's a very odd but simple project that doesn't involve electronics at all, but has a very delicious element of darkness to it in more ways than one. 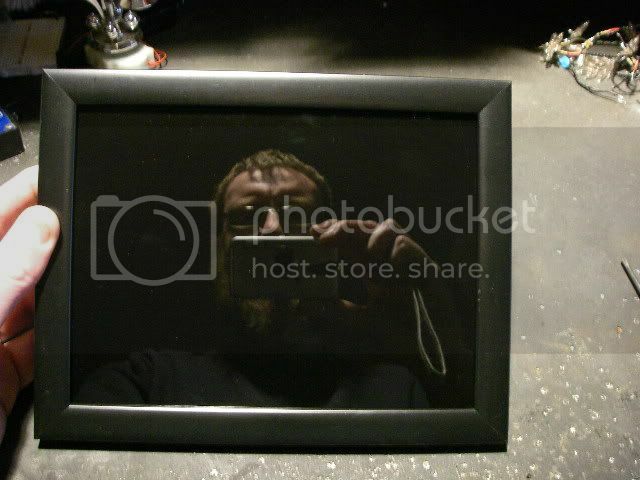 It's a scrying mirror. Basically a black mirror used to focus (or defocus) the mind to perceive images often perceived as spiritual. Have you ever laid in a dark room and gradually seen random images like people or portals into other places? Not everyone has this experience and it may be linked to forms of autism where the dream world leaks into waking vision. It happens to me, and I'll admit that in the past it used to be a bit scary at times. I can well understand why this would have been even scarier in the dark ages, and why they may have been interpreted as spiritual visions or prophecies when a child innocently told it's parents about the images it was seeing. As with many mystical things from the past, they became a business for those who could see these images and those who couldn't - but saw the business potential! Fortune telling became a lucrative business and the artefacts and props that fortune tellers used became parlour collectibles for those who wanted to delve in the "dark arts" for the thrill it gave. There were various artifacts used for scrying. Crystal balls, pools of dark water and black obsidian mirrors to name a few. The obsidian mirror was simple and functional as it presented a perfectly black surface upon which to gaze. (Think of the wicked witches magic mirror in Snow White.) This project is a modern equivalent of an obsidian mirror implemented using rear painted glass, that provides a very black and deep surface upon which to gaze. Obviously, what you make of this project will depend on how you regard the area from which it cometh. Some will see it as a slightly spooky Halloween-esque ornament for a shelf, others will value it as a very attractive and unusual ornament. Christians will probably not like it, since they'll assume it's the work of the devil, while practicing spiritualists or fortune tellers may use it as it was intended. Contrary to what you might read on the Internet, a scrying mirror does not open a portal to hell.... It's your mind that does that. This project carries a risk of cuts from sharp glass, noxious paint fumes, alienation of religious friends and the possibility of opening a portal through which demons might possess your very soul. As such, you tackle this project entirely at your own risk. Here are the materials we will need for this project. 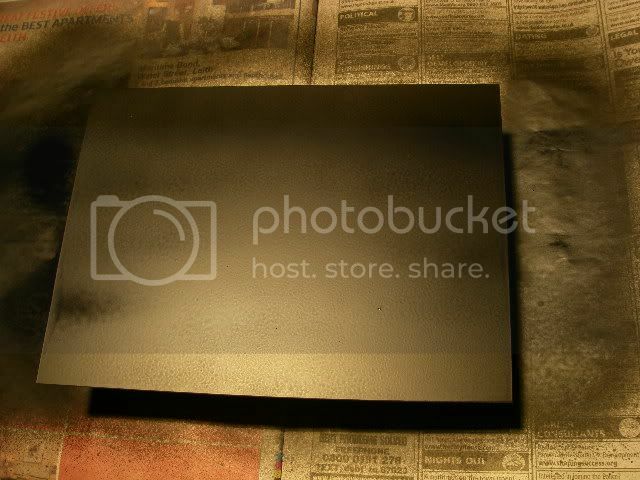 Nothing much, just an ordinary picture frame and a can of black spray paint. I got the frame from a pound/dollar store. Choose a simple black frame with no decoration, since the aim is to have as little visual distraction as possible. 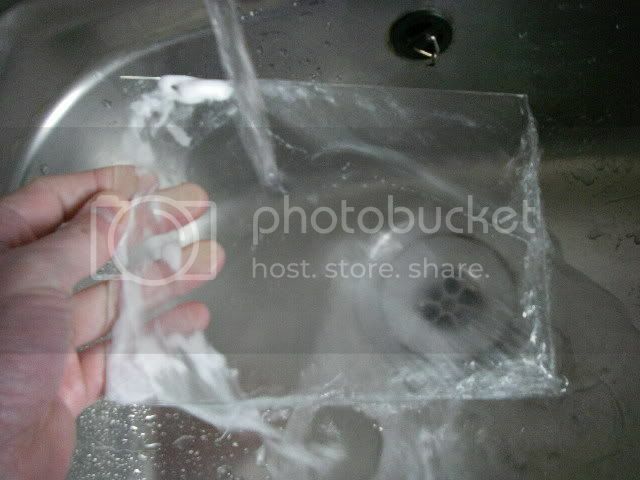 We start by removing the glass carefully from the picture frame. Be careful as the edges will be sharp. The glass is washed thoroughly to get rid of any greasy fingerprints and dirt before painting. once again I must stress that the edges of picture frame glass are generally as sharp as a knife, so a sliding contact will cause a cut. 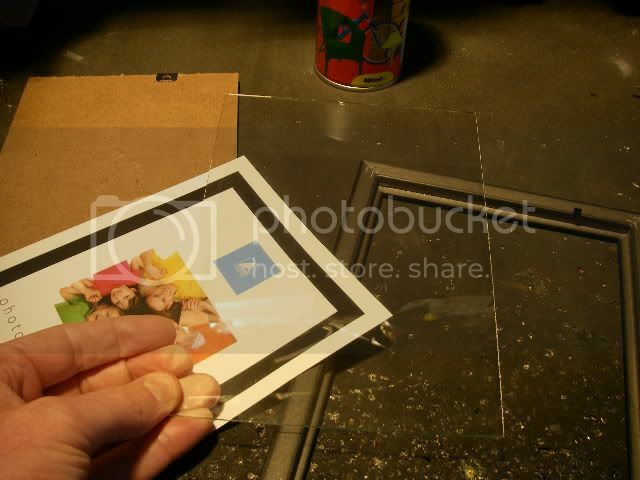 The glass is placed on a raised surface above some newspaper and a thin layer of paint sprayed on in a series of wide sweeps that overlap the edges to get good even coverage. 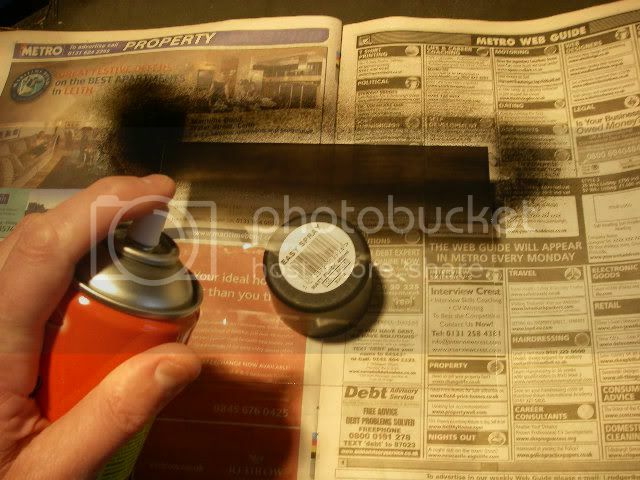 This is good practice for using spray paint in general. The reason for the raised surface is to try and minimise the amount of spray paint that manages to find its way onto the underside of the glass. 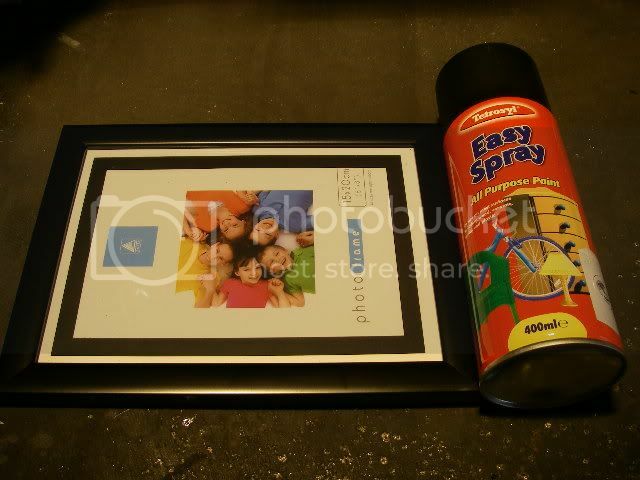 Keep spraying from side to side until you have covered the glass with a single layer of paint completely. Patience is a virtue! 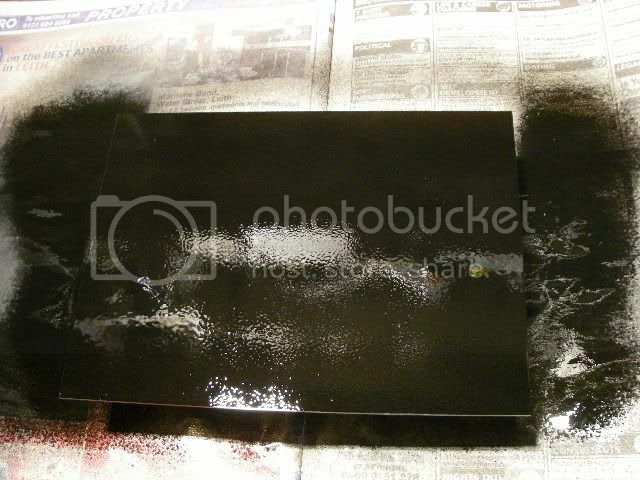 When spray painting anything you MUST use thin layers and wait patiently for each layer to dry before adding the next. You will want to do at least four layers of paint to ensure a good dense coverage. When you have applied the last coat of paint it's best to leave the paint to fully cure overnight to avoid accidentally scratching the surface of it. Once the paint has had plenty of time to dry you can check for overspray on the other side, and if there is any paint on it, it can be removed using a sharp blade as a scraper. 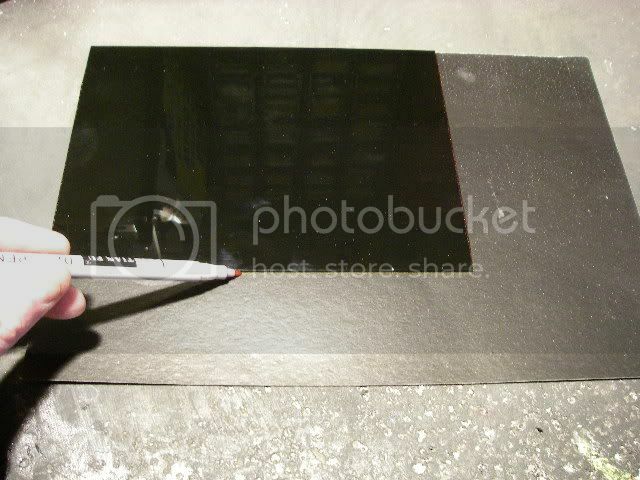 There's always a possibility that there are pinholes in the paint, so I used the glass as a template to draw its outine onto a sheet of black card and cut it to fit behind the glass. 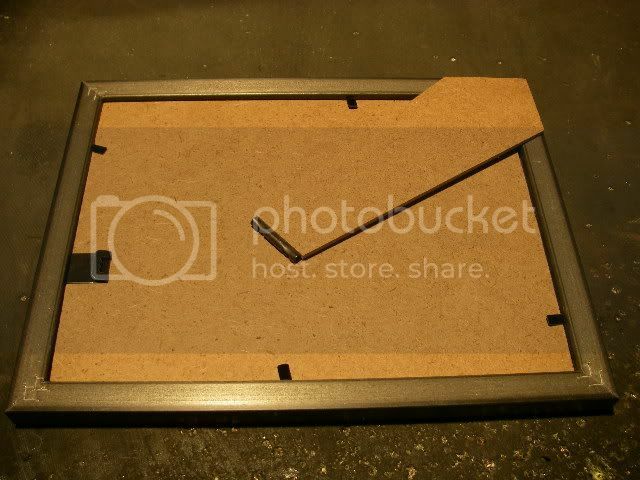 This will also protect the paint on the back of the glass from being scratched by any metal clips or fastenings that might be on the back panel of the frame. 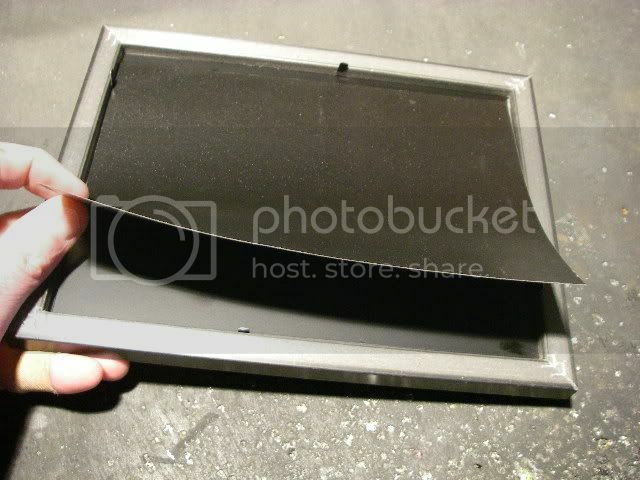 The glass is laid back into the frame with the painted side on the inside, and the card laid on top of the dry paint. The back of the frame is placed in and the retaining strips at the sides of the frame folded back down to hold everyting in place.